In the last week, two separate incidents at two separate Starbucks locations showcased the prevalence of racial discrimination and implicit bias in America in 2018. 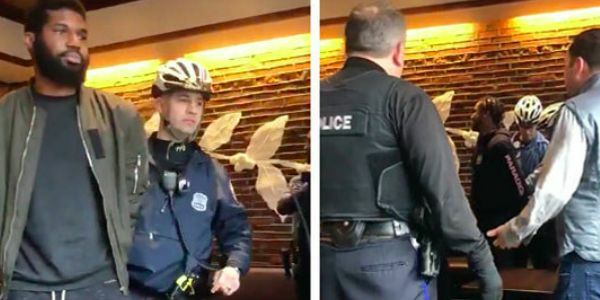 In the first incident, two black men were arrested for "trespassing" at a Philadelphia Starbucks after a store manager called the cops. The men were sitting in the store waiting for a third person to arrive for a business meeting and hadn't bought anything yet -- which is something people do all the time at Starbucks without any trouble. Videos captured by witnesses show the men calmly complying with the police before being handcuffed and arrested while customers repeatedly point out that the men were not doing anything wrong. A few days later, a store manager from a Los Angeles-area Starbucks reported a black man to authorities and had him removed from the store after he asked for the bathroom code without purchasing anything. However, just before the black man was denied the code, a white man had been allowed to use the bathroom with purchasing anything. Starbucks CEO Kevin Johnson was quick to apologize publicly and personally to the men in the Philadelphia incident, but clearly there is a larger problem that apologies won't fix. Please sign this petition urging Kevin Johnson to meet with Black Lives Matter activists in order to create and implement internal policies and training that will actual address the problem of implicit bias. People wait for friends or business partners and use the bathroom without buying anything at Starbucks all the time without being treated like criminals. It is absolutely absurd, albeit not shocking, that these men were singled out. Starbucks needs to do everything it can to combat employees' implicit biases. A first step would be to meet with the people tirelessly working to affirm the lives of black people. Sign now to tell Kevin Johnson to meet with Black Lives Matter and implement policies so that incidents like these don't happen again. Great news! Starbucks has announced it will close its 8,000 U.S. stores for an afternoon in May to educate employees about racial bias. The training will be designed with input from the NAACP, Anti-Defamation League, Equal Justice Initiative and Demos. Please share the petition to encourage Starbucks to meet with Black Lives Matter activists too!